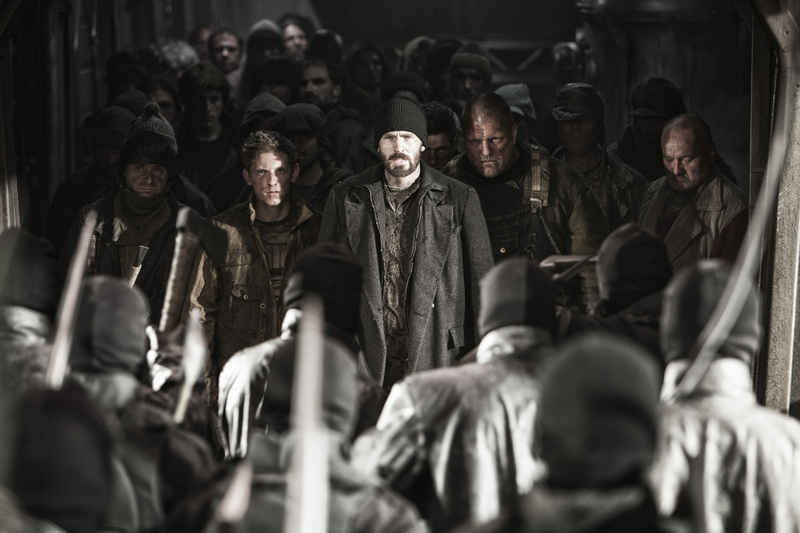 This article is a review of SNOWPIERCER. Relayed to us via an audio news montage, the heating up of the world through global warming has precipitated a drastic solution: The pumping of a gas called CW7 into the atmosphere to cool the planet. Three planes are spied in the distance strafing the sky. Cut to 2031, and a 17-year-old ice age has resulted, wiping out all life. All that remains are the inhabitants of a vast self-sustaining train powered by a perpetual-motion engine. 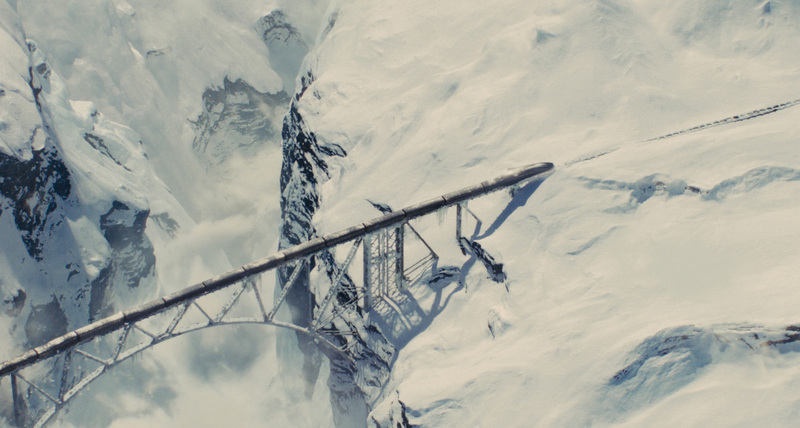 Owned by Wilfred Industries, the Snowpiercer circumnavigates the globe continually. Before the catastrophe, the mysterious, train-obsessive, Wizard-of-Oz-like, Wilfred managed to link all the tracks. Were you envisaging a harmonious utopia on board this ark? Not for those in the tail section. Unable to buy their way into the main carriages, they have been relegated to a cruel, degrading existence by their merciless masters. 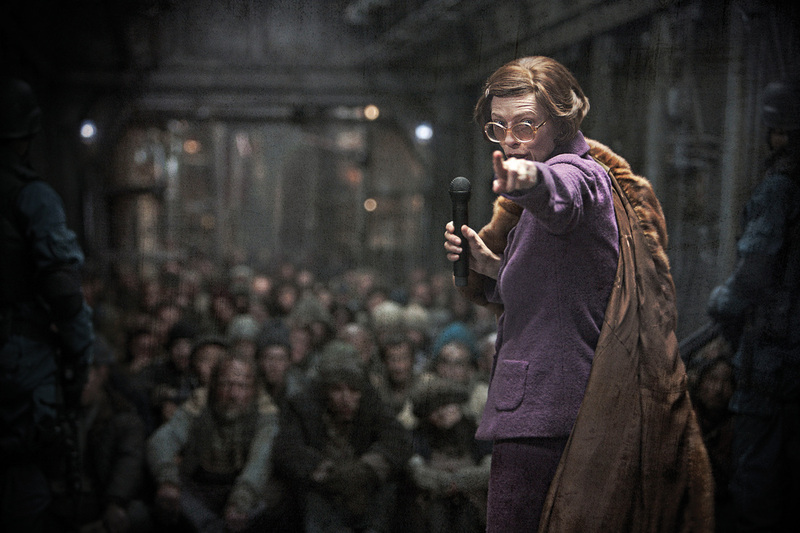 The figurehead of hatred, Minister Mason (Tilda Swinton), channelling a quasi-Margaret Thatcher chanting, “Know your place!” or “Preordained particular position”, and talk of “the sacred engine”; feudal brutality and pseudo-religious verbiage are used to suppress. First class, economy and freeloaders, is how the authorities divide this mini-society. From H.G. 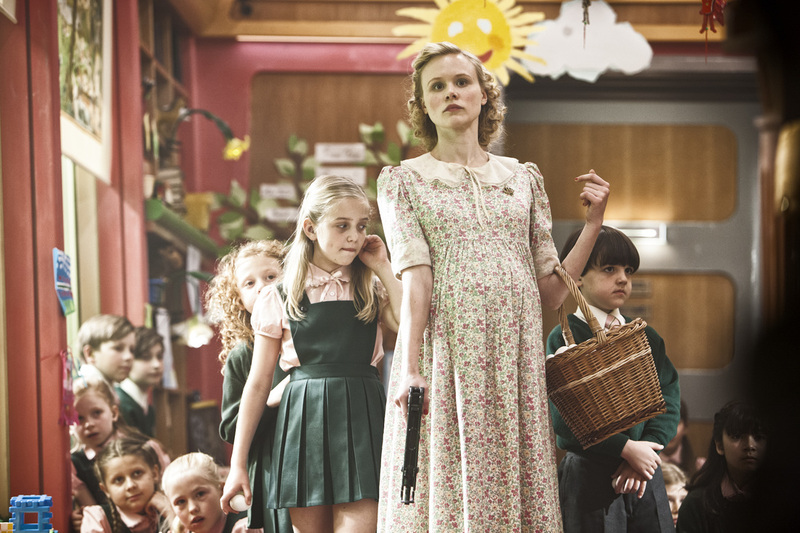 Wells to Fritz Lang to James Cameron to the Wachowski siblings to José Saramago to Cormac McCarthy to David Mitchell to Neill Blomkamp, great sci-fi has been preoccupied with the disenfranchised crushed under the yoke of tyranny, taken to the nth degree. Catharsis can come. 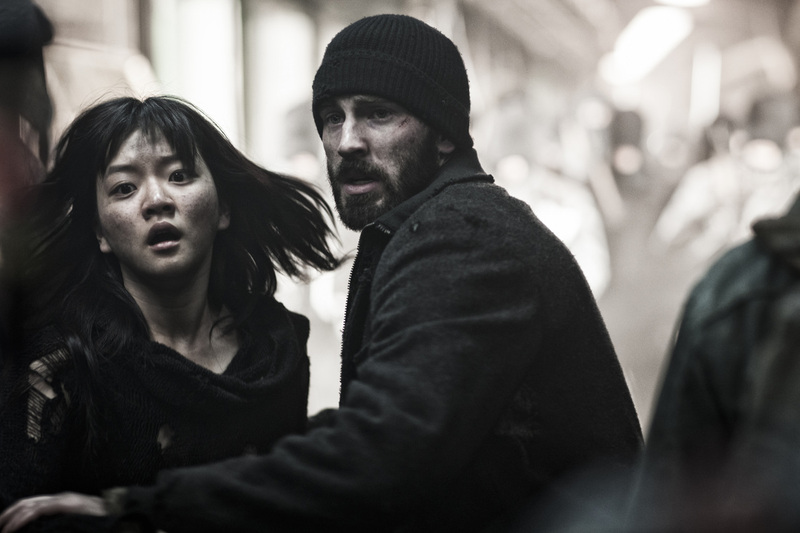 And SNOWPIERCER is all about exhilarating release. At a cost. Resistance is fermenting in the aft section. 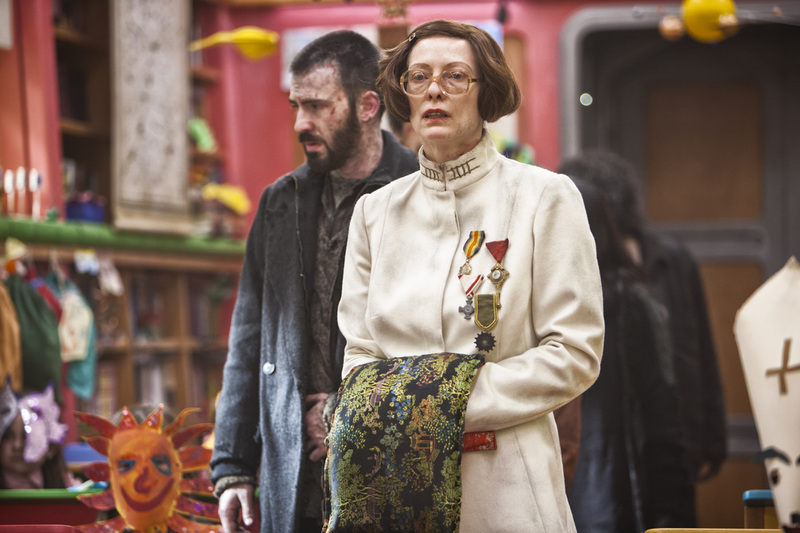 Fully aware of previous failed attempts, recently as four years earlier, Gilliam (John Hurt) is the mutilated ostensible leader, together with his protégé Curtis (Chris Evans). The plan is simple: To work systematically through the carriages until the front is captured. “All past revolutions have failed because they didn’t take control of the engine,” Curtis opines. Mixing chatty negotiations and breathtaking action sequences, do not underestimate the casualty rate. So many times you mutter yourself, ‘No! They didn’t just do that did they? !’ or turn to your neighbour to share in communal rapture. The multi-cultural production is a benchmark of world cinema teamwork. Character actors and movie stars from the UK, America, Europe and South Korea jostle in consonance, sending sparks of charisma flying in all directions. Gravitas coupled to badass fighters are in abundance on both sides. 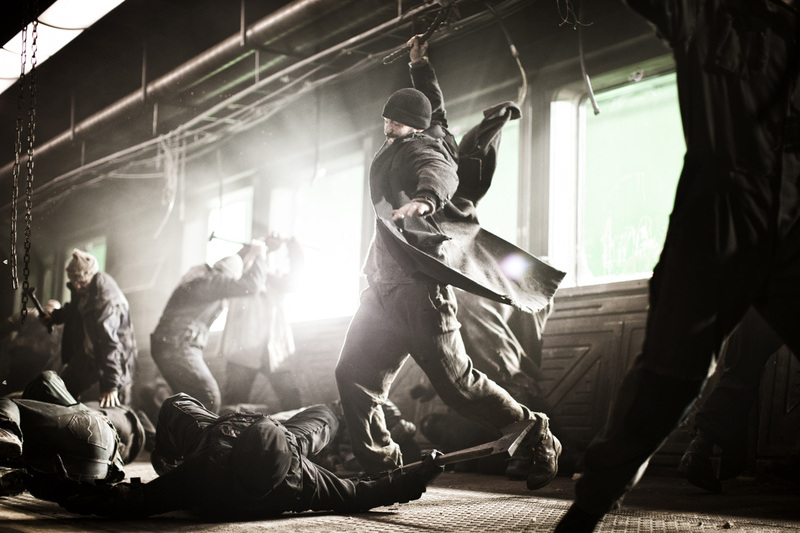 Watching focused assassin Franco Elder (Vlad Ivanov – 4 MONTHS, 3 WEEKS, 2 DAYS; POLICE, ADJECTIVE) take on Curtis, Grey (Luke Pasqualino – THE MUSKETEERS) and Namgoong Minsu (Song Kang-ho – SYMPATHY FOR MR VENGEANCE; MEMORIES OF MURDER), in the sauna carriage, is combat movie junky joy. Or when clairvoyant Yona (Ko Ah-sung – THE HOST) shouts too late to stop the doors to the next car from opening, the nightmarish armed force awaiting our heroes causes the audience collective jaw to drop into laps. Small moments too: Cigarettes have been extinct for a decade; when one is found and lit, the entire compartment breathes in. Class, politics, shoot’em ups, the environment, fisticuffs, magnetic performances, brawling, imagination. All the good stuff.